A recent breakthrough by UC Berkeley researchers will put the power of a microscope into the hands of anyone with a cell phone. CellScope, a low-cost microscope designed to be mounted on a mobile phone, will allow users in developing regions of the world to screen for diseases such as tuberculosis and malaria. To identify these diseases, doctors will be able to analyze cell phone images of blood samples that are enhanced by the microscope, which was showcased in a study in the July 22 issue of the online journal PLoS ONE. "In a lot of (developing) areas, you have cell phone coverage but not a lot of facilities," said David Breslauer, co-author of the study and a graduate student in the bioengineering department. "If you can make a new technology where you can get the lab to them and have doctors go door to door, you are benefitting them." The CellScope can capture both bright field images-those requiring regular white light-and fluorescent images, which require staining the sample with a dye that emits a special wavelength. The microscope picks up the wavelength with a filter and special LED lights. As a result, specific parts of the sample, such as rod-shaped tuberculosis bacteria, can be tagged with the dye and isolated to be seen clearly. Robi Maamari, a UC Berkeley research associate in bioengineering and co-author of the study, said that the microscope can be a real asset for those treating diseases in developing regions. CellScope's $7 LED lights use low levels of power, a feature which is crucial in poorer countries where electricity is not readily available throughout the day. CellScope also has implications domestically, Maamari said. It can facilitate the screening process for those in isolated locations and for those undergoing chemotherapy who need to keep a close watch on their white blood cell count. "They will be able to stay at home and send images to doctors using CellScope," he said. The researchers are currently working with scientists at UCSF to perform field tests and refine the prototype. They are also considering contacting large corporations to manufacture the microscopes. "We are working on developing a similar field-ready, robust prototype that can be given to other people to figure out whether or not it would get the same result," Breslauer said. 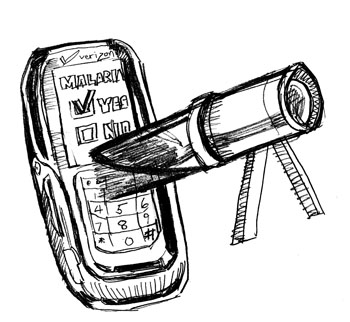 The CellScope project is funded by two UC Berkeley centers: the Center for Information Technology Research in the Interest of Society and the Blum Center for Developing Economies, according to a campus press release. Microsoft Research, Intel and the Vodafone Americas Foundation have also provided funding for the project.